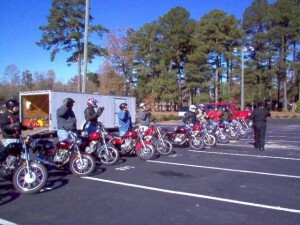 Basic Rider Course (BRC): This 20 – 22 hour course is designed for new riders who have never ridden a motorcycle, and for re‑entry riders who have not ridden in a long time. Even experienced riders who have taken this course have told us afterwards that they learned a lot. Persons interested in attending a BRC must be 16 years of age or older. Students under the age of 18 must have the written consent of a parent or guardian. You should have a driver’s license or learner’s permit to take the course. However, you must be able to ride a bicycle, and you must possess some degree of strength. THE COURSE IS PHYSICALLY DEMANDING!! You should be able to support a 300‑pound motorcycle while straddling it, and have the ability to push the motorcycle for distances up to 120 feet. Heat and cold weather conditions can add to the strenuous conditions you’ll encounter while taking the course. IMPORTANT NOTE!! Our courses are run through the Self-Supporting divisions of the Continuing Education Programs. This means that your tuition fee will not be refunded if you fail to show up for class, or if you fail to complete the course. The Basic RiderCourse is conducted at a pace that results in successful completion for most novice riders. However, if you experience significant difficulty or become a safety risk to yourself or others, you will not be permitted to continue to ride. To view a video about the BRC, visit the MSF website at www.msf-usa.org. Upon successful completion of the BRC, you will be issued a skills waiver card for the NCDMV. 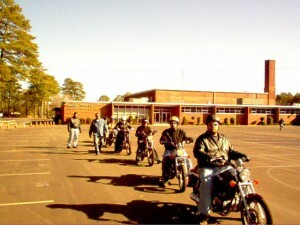 This means the DMV will not require you to take their motorcycle riding test. You will still be required to visit your local DMV office and take their written exam before being issued a motorcycle endorsement.